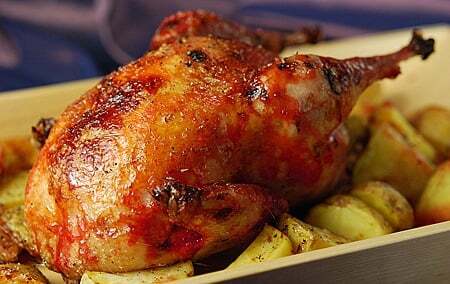 There’s always something lovely about a well-roasted, sweet-and-savory glazed bird. Chickens are the norm, but there is no reason not to do it with pheasants, too. After all, they’re basically ditch chickens. Real wild pheasants are very lean and are a bit more difficult to cook. If your pheasants are the real deal, brine the birds for 4 to 8 hours beforehand, and be religious about basting the pheasant while cooking. Many of us shoot pheasants at hunting preserves, however, and while not exactly the most challenging “hunt,” pen-raised pheasants do have the advantage of being fat. And tender. This recipe is ideal with this sort of ditch chicken, or with one you buy frozen in fancy supermarkets. Keys to success here are to be sure to brine the bird, and be sure to start breast side down — whatever fat the pheasant has will drip down onto the breast and help keep it moist. Also, watch your glaze once its on — you can go from caramelized loveliness to burnt crap in about 2 minutes. If you want to keep things simple, here’s my basic Roast Pheasant Recipe. Mix the salt and water together and whisk to dissolve the salt. When it is dissolved, pour it over the pheasant in a plastic or ceramic container, cover, and leave in the fridge for at least 4 hours, and up to 8 hours. Remove the pheasant and pat it dry. Let it rest on a cutting board while you preheat the oven to 450°F, about 15-20 minutes. Put the sprig of sage into the pheasant’s cavity and dust the pheasant with cayenne pepper. Place the bird breast side down on a rack in a roasting pan. If you don’t have a proper rack, rig something up with halved onions, carrots or the like. I arrange potatoes around the pheasant, which serve as a good side dish. Roast the pheasant for 15 minutes at 450°F, then drop the heat to 375°F and roast for another 20 minutes. Turn the pheasant breast side up and baste with the syrup. Roast for another 30-40 minutes, basting twice in the first 20 minutes. Keep watching the glaze, and remove the pheasant immediately if it burns too much — expect some burning at the edges of the legs and wings. When the pheasant is done (thigh should be 160°F when poked with a thermometer), remove to a cutting board and tent loosely with foil. Don’t mess with it for 10-15 minutes. To serve, carve the bird and grind some black pepper over it. Excited about this recipe! I just obtained six lovely pheasants – each is 1.5 pounds – is this recipe for a 3 pound bird? Any guidance for roasting six birds at once (total weight 9 pounds)?